Woodchip, wood pellet and biomass boilers have gained huge popularity in Ireland in recent years and we are proud to play our part in producing this new eco-friendly fuel. Not only are woodchip boilers extremely energy efficient, they also utilise a sustainable fuel source that is kind to the environment. Woodchip provides a cheaper alternative to oil or fossil fuels. Woodchip as a fuel is a sustainable energy. It is environmentally friendly and has zero carbon emissions. Woodchip is an important element of tackling climate change. Our chips are monitored continually for particle size and moisture content to meet the regulatory standards. 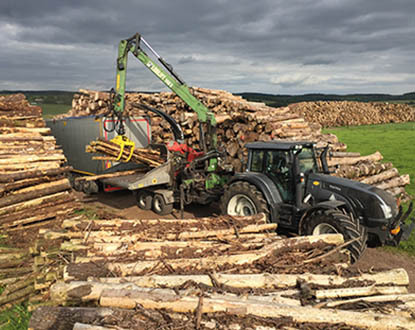 Timber is dried to required moisture content then chipped and transported to wood fuel boilers throughout Ireland. For wood chipping we use a Mus-max WT9 GXL, a new woodchipper, and the first of its kind here. Timber can be chipped in forestry or on site if required. Farmers or property owners who want to tidy up ditches have the alternative option of turning the scrub into chip on site rather than burning or stock piling. 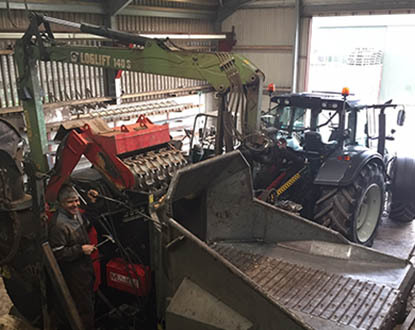 Farmers who have willow plantations can have their product chipped on site using this mobile service. Bulk feed blown or tipped, registered with the department of agriculture. Low Loader, suitable for track machines and agricultural machine haulage. Bulk tipper haulage, fertilisers etc.